© Bridget Riley 2016. All rights reserved. John Berggruen Gallery is pleased to present a solo exhibition by Bridget Riley, the artist’s first exhibition in San Francisco. 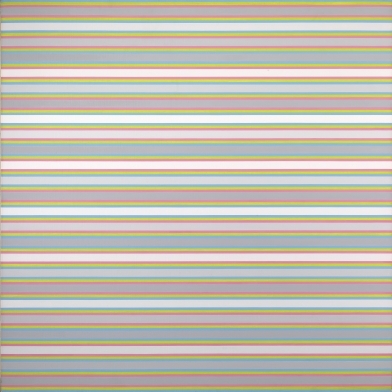 Bridget Riley: The Interactive Character of Color, 1970-2014 will feature a contemporary and historical selection of Riley’s seminal color paintings, which shed light on her experimentation with color, form, light, and tone. Through her careful geometric studies and close pairings of color and forms, Riley explores the precarious nature of balance, looking at the way in which the slightest compositional shift can dramatically transform the tone and nature of a work, and how the pairing of disparate colors can alter the viewer’s perception of the true nature of the color itself. This exhibition will explore her various uses of color to address her belief that “everything that would constitute a viable art form had to be found, discovered, re-invented or recreated." Riley began her career creating figurative works that tended towards Impressionism and experimenting with Pointillism. In 1959 she painted a copy of George Seurat’s Bridge of Courbevoie to better understand his use of perception and color, a process that was transformative to her practice. Riley ultimately came to prominence through her pioneering experimentation with optics and perception, and today is considered one of the foremost members of the Op Art movement. Initially taking black and white geometric forms as her starting point, Riley created disorienting patterns that drew on the repetitive use of a single form to distort the viewer’s visual field and evoke the feeling of constant movement within the painting—what she described as the disruption of stable elements. She eventual began experimenting with tonalities of gray as well, before eventually moving on to incorporate color into her works. The exhibition at Berggruen Gallery will explore the formal themes that run through her color works, drawing attention to the way these careful studies of color and form converge in her mature works, which at once elicit tremendous vibrancy and, at the same time, great restraint. Of this practice she once said, “At the core of color lies a paradox. It is simultaneously one thing and several things – you can never see color by itself, it is always affected by other colors…Color relationships in painting depend on the interactive character of color; this is its essential nature.” Limiting her palette in each work to a select handful of colors, Riley creates works that show the dynamism of color through contrast, repetition, and juxtaposition, looking at the way colors fuse by being placed next to each other, and how those pairings alter our perception of that color. In these works, Riley uses color as a form itself, changing the way it is positioned on the canvas in relation to other color forms to achieve the same sense of lifelike activity and movement that she had previously achieved with geometric forms, demonstrating that color perception is not static, but relative and contingent upon context. With works from 1970 to 2014 on view, this survey exhibition will highlight Riley’s ongoing fascination with unexpected color palettes and her thought-provoking use of space on a canvas, looking at the way her earliest exploration of color has carried through to a dynamic contemporary practice. Bridget Riley was born in 1931 in London, where she lives and works today. She spent much of her childhood in Cornwall, which she credits as forming “the basis for [her] visual life,” and attended both Goldsmiths College and the Royal College of Art. Riley participated in Documenta IV and VI and, along with Phillip King, represented Great Britain in the 1968 Venice Biennale. She was awarded the International Prize for Painting at the Venice Biennale, making her the first woman ever to win the award. She has been the subject of solo exhibitions at numerous institutions including: The Art Institute of Chicago; National Gallery, London; Musée d’Art Moderne de la Ville de Paris; Tate Britain, London; Museum of Modern Art, New York; and National Gallery, Prague. Her work is included in the permanent collections of numerous institutions including: Dia Art Foundation, New York; Los Angeles County Museum of Art; The Metropolitan Museum of Art, New York; Centre Pompidou, Paris; and the Stedelijk Museum, Amsterdam. 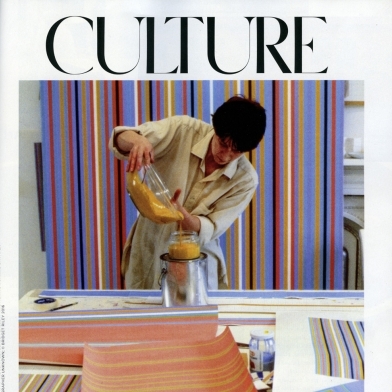 Bridget Riley: The Interactive Character of Color, 1970-2014, April 27 - June 30, 2016. On view at 228 Grant Avenue, San Francisco, CA 94108. Images and preview are available upon request. For all inquiries, please contact the gallery by phone 415-781-4629 or by email info@berggruen.com. Large groups must schedule an appointment in advance. Gallery hours: Monday – Friday: 9:30 a.m – 5:30 p.m.; Saturday: 10:30 a.m. – 5 p.m.